The cost of the above course is £145. Newtownards Sailing Club has a large thriving band of windsurfers who sail regularly in the safe but interesting windsurfing conditions at the club. The prevailing wind is on shore which makes for excellent safety in primarily flat water conditions. For beginners and intermediates, there is a bay beside the club with excellent shelter while learning the basics. And when the tide is out, there is approximately half a mile of waist deep water which makes for easy practising when learning to water start or gybe! The windsurfers keep in touch by e-mail or Facebook, sometimes organising last minute mass sailings e.g. 2 days after Christmas. They also organise holidays to warm and windy places such as Egypt in 2009 and 2012. From Spring to Autumn, Tuesday night is windsurfing club night. With rescue boat cover on standby if needed, beginners, intermediate and advanced are encouraged to go out and have a go and it is a rare occasion that you would sail alone if there is any wind. Lessons are available for non-members and members alike and are run during the summer. 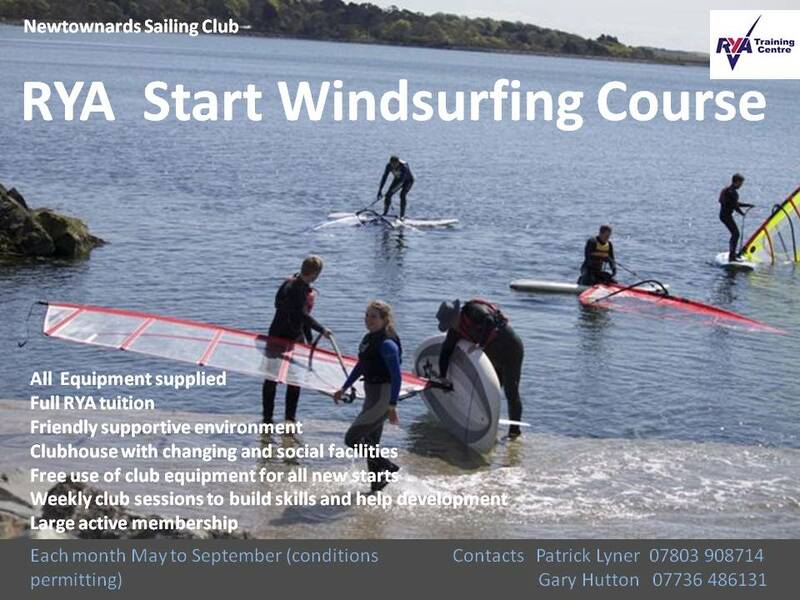 The Club has a number of Beginners' Boards and Sails thanks to a grant from the Sports Council. This makes learning easier and a lot of fun. With a friendly atmosphere and many people who live to windsurf, new members are encouraged to progress and push themselves with advice given when needed so you can reach that next level. For more details on becoming a member, or for lessons, use the 'Contact Us' page to get in touch. Or you can call Patrick Lyner on 07803 908714 who will be happy to answer your queries.